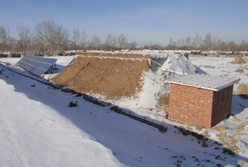 Project Location: Baita, Yulin Town, Hohhot City, Inner Mongolia. Project Introduction: Yulin Town lies at East Hohhot City, 35 Km away from downtown. Yulin belongs to semi mountain area, a remote and poor town. Jing-Bao railway line and expressway line 110 cross Yulin Town. With the guidance from China government ‘s acceleration development for new rural construction and modern agriculture, Yulin town has adopted solar pumping system and built reservoir station to meet the village residential daily water demands. Solution: Shenzhen Solartech Renewable Energy Co.,Ltd, supplied solar pumping system PS9200 which can pump 100m3 per day at 80m head. One reservoir which can reserve 300m3water has been built near the solar pumping system project site. The reservoir protected water from being frozen and completely supplied enough living water for the whole village for a whole year. The system’s life span is 25 years as a standalone living water supply system. The system has avoided outside main pipe network construction and saved a lot of construction &maintenance cost. 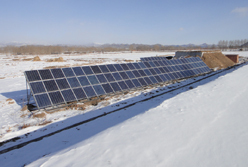 Solar pumping system station has played a very important role at rural living condition improvement, new rural construction and industry development. Economic Benefits: Solartech PS9200 solar pumping system can annually generate 32 850 Kwh. The system can save standard coal 309 tons, emission reduction of CO2 135.9 tons, SO2 6.2 tons, smoke 4.6 tons, lime ash 80.3 tons.